Sometimes when reading a picture book, you learn something about yourself. This year, I learned I like creepy. 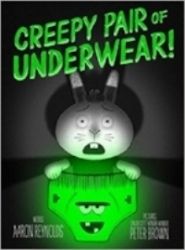 Two of my favorite picture books have been Aaron Reynolds' Creepy Pair of Underwear! 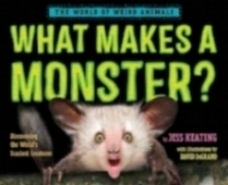 and Jess Keating's What Makes a Monster? I had a blast reading these aloud to the students in my kindergarten enrichment class. The kids were hanging on every word and literally begged for more when I finished. Yet, these two books are very different. One is a fiction narrative. The other is expository nonfiction. One features a cute, anthropomorphized rabbit named Jasper, the other an assortment of real creatures from around the world. One is illustrated with pencil on paper and digitally composed and colored. The other is illustrated with photographs. But, what these books have in common is the 'creepy' factor. When reading the books, I was surprised how far the author had gone to achieve the desired effects. Glowing underpants! Brain-eating fungi! Scratchy, scraping noises in the night and bone claws protruding from frogs' fingers! Gross! Creepy! Cool! I don't think there are many picture books that go to this length to induce nail-biting and squirmy seats. But, I'd better start looking because, not only do I like creepy, so do my students. If you have any creepy book suggestions, I hope you'll leave them in the comments for us all to enjoy! Creepy Pair of Underwear! written by Aaron Reynolds, illustrated by Peter Brown. What Makes a Monster? written by Jess Keating, illustrated by David DeGrand.